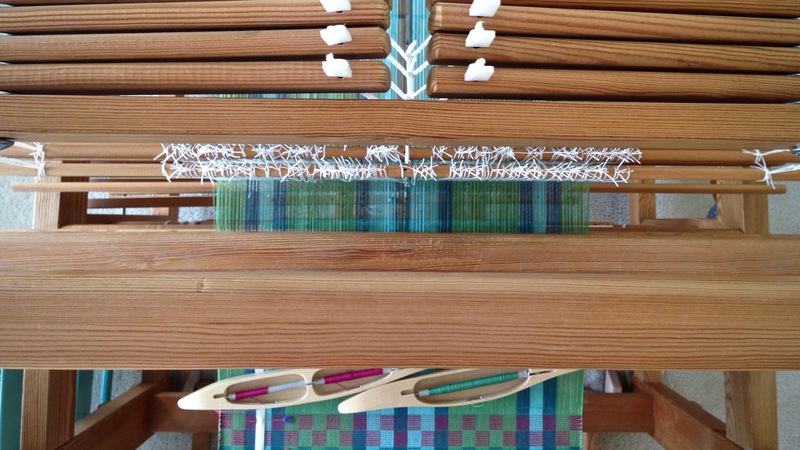 Double bobbin shuttle carries the doubled weft. Breast beam with thick and thin towels. 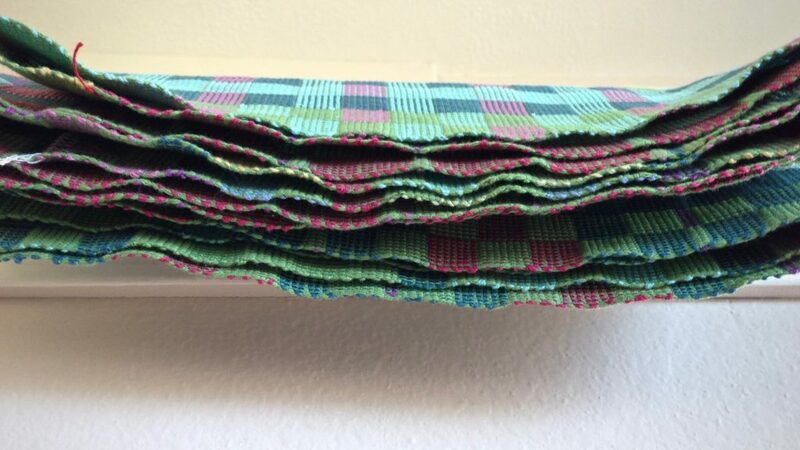 Cut from the loom, new colorful thick and thin towels. Towels just off the loom. Guess what!? My project was accepted for publication. Not only that, these towels that I enjoyed designing and weaving have been placed on the cover! What an unexpected privilege! Credit: Photograph by Joe Coca from Handwoven November/December 2016 magazine. Copyright © F+W Media 2016. As great as it is to have your handiwork appear on the cover of a national publication, there is something even greater–being loved. Being on the receiving end of kindness, compassion, and forgiveness. Love is like that. Love is to be demonstrated. That’s how Christ demonstrated his love to me–kindness, compassion, and forgiveness. His love is printed on the cover of my heart, with instructions written within so that I can learn to love like I’ve been loved. That’s the cover story I like to tell. May your heart be covered with love. PS I am recovering from back surgery better than anyone expected. I’m not weaving yet, of course, but I have no shortage of things to share with you while I regain my strength! Thanks for your wonderful encouraging words and prayers for my full recovery. 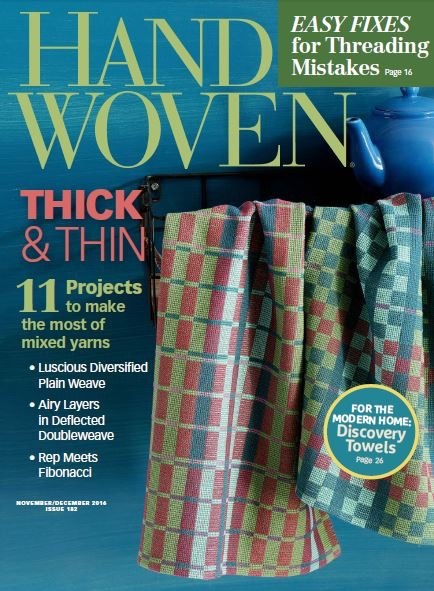 PPS My draft and instructions for the thick and thin towels are in this Handwoven November/December 2016 issue. This is the same draft I used for the black and white towels. Congratulations, Karen! You’re a wonderful example of creativity and craft I the weaving world! Thanks, Debbie, for such a thoughtful compliment! Shearling, Thanks! I thought the black and white towels really stood out, too; it was fun to see what some color could do. I can’t wait for my copy of Handwoven to arrive in my mail box! Congratulations and wishing you a continued speedy recovery. Dear Ruth, I’m glad to give you something to look forward to. Thank you! I appreciate your well wishes! Congratulations Karen!! I’m excited to get my copy and definitely will weave these!! Hi Janet, Thanks so much! I’d love to see what you do with this. Please send me a picture! Congratulations! Looking for to my copy of Handwoven. What an honor. How thrilling for you and well deserved. I loved the black and white posting so much that I took on the challenge on my RH. It stretched my brain to get the threading right but at the end I was thrilled with them and plan on weaving more. Now I will have visuals in a multi colored combination. Thanks for all you do. Congratulations! What an honour to have your project selected for the cover! Hi Sandy, Thank you! It is a thrill to make the cover, for sure. Gratulations! To me, this exemplifies your sincere willingness to share your knowledge, how joyfully you give of yourself…your readiness to serve. I am really thankful that you in everything you do demonstrate such love. Oh Elisabeth, Your encouragement and kindness touches me deeply. Thank you, dear friend. You are healing more quickly than anyone thought because your True Divine nature is shinning through! How fun and exciting for that and for your beautiful expression of Divine creativity to be shared front and center with our weaving community. Julia, You are so sweet! Thank you for your very kind words. Congratulations!!! And that cover pic is one of the most beautiful ones I’ve seen in a while. Thank you, Cindie! I am extremely pleased with the photography for this issue — on the cover and on the article page (which I did not reveal). They did a great job! Karen, that is FANTASTIC! Congratulations….I’m looking forward to this issue! Hi Marcia, Your enthusiasm blesses me! Thank you so much! WOW! Congratulations, Karen! Your work is always beautiful! So glad you are recovering nicely from the back surgery. Thank you so much, D’Anne! Looking forward to being back at our WOW weaving group. I’ll bring the towels for show & tell when I come. Oh I’m so happy for you Karen! Both the cover and the surgery. You deserve it! Liberty, I appreciate your sweet words! I feel like I’m getting much more than I deserve. Whoot! Whoot! Huzzah for the cover girl! Karen, your project looks fantastic on the HW cover. Looking forward to seeing the magazine when it hits my mailbox. Congratulations. Thank you so much, Martha! I am pretty excited about it! I think they did an excellent job with the staging, photography, and type print color for the cover. I’m glad my towels get to be a part of that! Hi Karen, we have mutual friends from the Mustard Seed days and I saw one of them like your FB post so I came to check you out. While art was not my major in college at KU I took two weaving classes and LOVED them. I am so jealous. Years ago my dad wanted to buy me a loom but we had a small house at that time. These towels are so beautiful. Congratulations on the recognition. Thank you for the gracious compliments! Hi, Doree, It’s wonderful to hear from you! Art is a gift from the Father’s hand. I know He has a beautiful path for you with your watercolor painting. I have seen some of your work on FB– it’s outstanding! How exciting! Congratulations on getting the cover! I am so excited for you. I’m excited for the rest of us too, to be getting the draft for your wonderful towels. 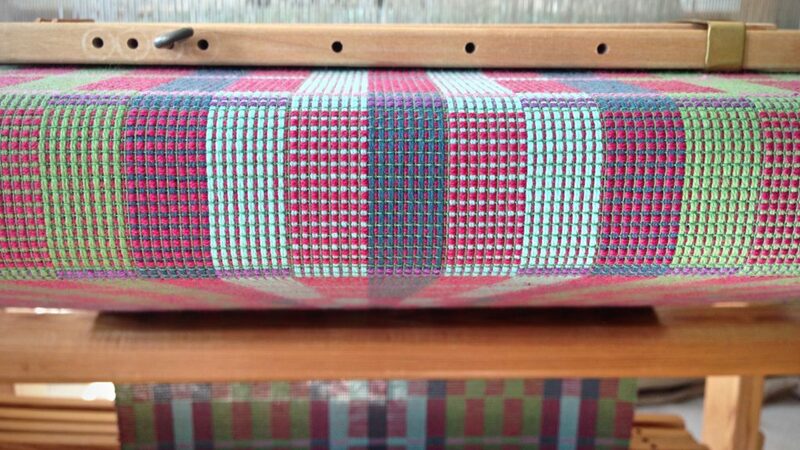 I’ll be keeping my eyes open, waiting for Handwoven to arrive. Thank you so much, Leigh! I’m keeping my eyes open, too, waiting for that magazine to arrive!! Please let me know if you try the draft. I’d love to hear how it goes, and see pics of what you do with it! The colored towels are as stunning as the black, white and red! Thank you so much for sharing your skills and insight with us. Congratulations on the HW article and cover!! Your blending your talents with your faith is a Blessing to those of us who follow you. Continue to heal in God’s care. Kris, The black and white towels were out of my color zone, so I was surprised that I enjoyed weaving them so much. These colored towels are in my color zone. I’m always happy working with color! It’s a blessing to have your encouragement. The towels are beautiful! What an honor you have been given to be on a magazine cover and as always, your words of honor to the Lord are best of all. May Jehovah-Rapha, our Healer, continue His healing work each day. Hi Bev, Thank you for your kind thoughts and words. That means a lot to me! Mazel Tov and may you heal quickly! Dear Tobie, Thank you so very much! That felt like a generous hug. Congratulations on your published project and recovery. I love the colors you used. Can hardly wait to get the magazine. Keep up the good work on your recovery and don’t overdo. I had neck surgery a few years back and I remember feeling so much better without the pain. It was very tempting to become more active. Resist it. Enjoy this time for quiet reflection and planning other projects. Thank you, Carolyn! I’m eager to see that magazine in my mailbox, too. I’m taking your advice to heart. It is a good time for doing some finishing work and planning new projects. I appreciate the good word. Thank you, Karen! I appreciate that! Wishing you the best on your recovery !! 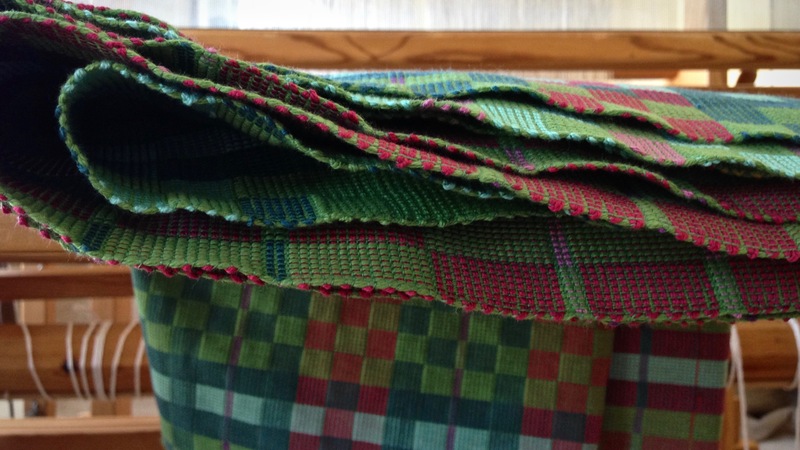 Re: the Handwoven article – first congratulations on the article and getting on the cover. I am unclear on the Grass yarn. On page 26, it is referred to as 16/2. On page 28, the Grass yarn is referred to as 30/2. Typo? Error? Am I missing something? Hi Louise, Yes, it is a typo. It should read 30/2 cotton in both places. I’m sorry for the confusion. However, 16/2 or 20/2 would also work in place of 30/2. The main thing is to have a contrast between the sizes of yarn. The greater the contrast, the more dramatic the pattern.